An inside look at the obsessive, secretive, and often bizarre world of high-profile stamp collecting, told through the journey of the world’s most sought-after stamp. ...the sort of oddball, breezy read that’s perfect for a long flight or train trip ... Its current owner is the shoe designer Stuart Weitzman. Weitzman likes to collect rare things. 'It has been a record-setter time after time not because it is a stamp but because it is the only one of its kind,' Barron writes. 'What [Weitzman] wanted was the thing that no one else could have.' And that is the appeal of this unusual stamp, its mystique captured in this delightful book. 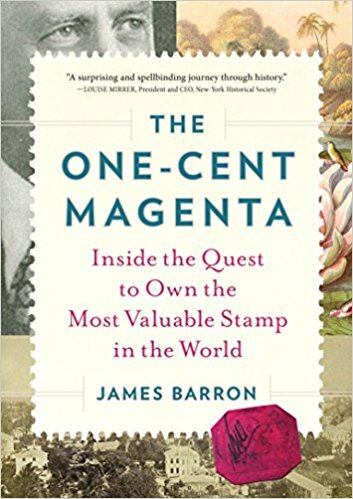 In tracing the path of the magenta over more than 160 years, Barron touches on the history of postal service, the legal wrangles of the rich and powerful, and the change in collectibles from hobby to investment portfolio. He describes the larger-than-life personalities who have owned the magenta, including John E. du Pont, the chemical heir whose privileged life devolved into madness and murder ... Barron got the idea for his book after writing a newspaper story about the stamp, and his work has the feeling of an entertaining, in-depth magazine story that’s been padded out to book length. But the key is 'entertaining.' The voyage into Stamp World is like the world itself: detailed, ruminative and filled with arcane detours ultimately leading to a destination whose rewards are subtle yet satisfying. Since the stamp’s first two owners are average-enough men, this short book could have been even more compact: It is only once the stamp travels to Europe that the truly crazed and crazy collectors appear and Barron’s detailed attention to each one pays off. Interlaced with the history of the magenta is the question of its worth today, when the prestige of stamp-collecting is all but obsolete. Barron first learns of the stamp from a Sotheby’s auctioneer and strings along the small drama of its sale throughout the book. The resolution of the auction and Barron’s unveiling of its winner are less satisfying than the new owner’s reason for buying the magenta: He’s not interested in stamps so much as one-of-a-kind treasures. Barron recognizes that for most people stamps’ romance has long since dissipated, but he succeeds in showing why this one stamp, at least, is still alluring. What did you think of The One-Cent Magenta?